More reporters and commentators dedicated exclusively to tax issues. More reporters and commentators dedicated exclusively to tax issues than any other news organization. Nick Kokis Attorney & Principal, Kokis & Associates, P.C. My week is not complete until I've read Billy's column. He was able to take complicated ideas and explain them to members of Congress in a way that wasn't talking down. Where else can you catch both the latest on a tax shelter and hear some cultural commentary about the Hamptons? Tax Notes offers a wide array of products, including federal, state and local, and international tax news, commentary, and analysis (available both online and in print), as well as select research tools. We offer our products for sale through our website here, where you may purchase single-user subscriptions. If you need help finding out which products are best for you and your team, you may contact us by clicking here, calling (800) 955-2444, or emailing us at products@taxnotes.com. Our online services publish daily, and our print publications are delivered on either a weekly or monthly basis (depending on the publication). Tax Notes serves a wide variety of customers from many industries, including multi-national corporations, law firms from large to small, the Big Four and super-regional accounting firms, federal and state governments, nonprofit organizations, and universities and institutions of higher education. Tax Notes customers may access online services by computer, tablet, and mobile phone. Print magazines may be delivered in print or PDF, and are also accessible via an online flipbook. Tax Analysts is a mission-based nonprofit organization whose mission is to protect the integrity of tax systems. 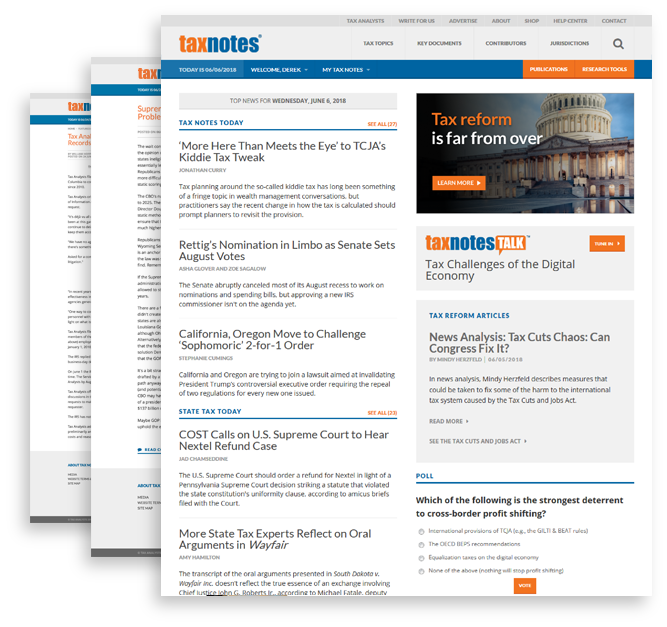 Tax Analysts is also the publisher of Tax Notes, a subscription-based portfolio of services that offers federal, state, and international tax news, commentary, and analysis, as well as select research tools. Tax Analysts does not provide tax advice or preparation services. To submit an article, click here and follow the directions. Good luck! Can I promote my conference, event, or business? We are happy to offer a variety of opportunities for promotion, including print, online, and direct mail. You can find out more information here.